Here at Fortree City, everyone lives in a treehouse. In the house next to the Pokemon Center, a girl would like to trade her Skitty for your Pikachu, if you have one, that is. Now go out from that house to the next house. There's an old lady inside, and asks you to guess which hand does she have a coin. She'll ask three times, and it goes like this: right, right, left. After that, she'll give you TM10 - Hidden Power. Southeast of the city is a store in which you can buy decorations that are directly sent to your PC. There is something invisible blocking the gym, so you won't be able to get in. Go to Route 120 now and go south. There is a hidden Revive in the tall grass. Cross the bridge, and you'll see Steven. After a battle with his Kecleon, he'll give you the Devon Scope. It allows you to see any unseeable Pokemon. Now go back to the gym, and press "A" to the place where you can't get in. The Devon Scope is automatically used, and you'll see a Kecleon getting away. Finally, you can get into the gym! This is a Flying Pokemon gym, and there are many rotating doors that you must get through, and they're pretty confusing. From the start, go right, and battle the trainer. Continue right, and you'll meet up with another trainer. Next, move one step to the left and one step down. Go up, and move the door on the right counterclockwise. Then move the door on the left counterclockwise. Then get through from the door on the right. When you get through, go up, battle the trainer, and continue upwards. After fighting the trainer move 1 space to the left and 6 spaces up. To solve to puzzle move 7 spaces to the right, 2 spaces up, 3 spaces right, 1 space up, 1 space left, 1 space down and 2 spaces right. You still need to walk 2 spaces up to fight the next trainer. Next move around the wall then go straight down. Move around the next wall and back up. Finally you meet the gym leader. She's called Winona. She has a lv. 31 Swellow, a lv. 32 Skarmory, a lv. 30 Pelipper, and a lv. 33 Altaria. The Altaria is very strong, so watch out! After beating Winona, she'll give you TM40 - Aerial Ace and the Feather Badge. Now all Pokemon up to lv. 70 will obey you. This badge also allows you to use Fly outside of battle. Now get out of the gym, and fly to Littleroot Town. There, talk to your mom, and she'll give you an Amulet Coin, which doubles the money you attach it to a Pokemon that takes part in a battle. 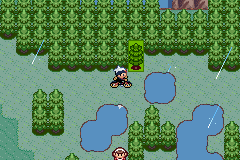 Fly back to Fortree City, and continue on to Route 120. Once you get onto Route 120, you'll see an Itemball in the tall grasses. An invisible Kecleon is blocking it. After capturing/defeating it, you can get the item, which turns out to be a Nest Ball. As you travel on this route, it'll start raining. The sky gets darker, and the rain just starts falling. All battles from now on will have Rain Dance's effects. On the second area of tall grasses, another Kecleon remains invisible until you press "A" against it. After you reach the second bridge, the rain stops, and you can see reflections of the clouds in the water. 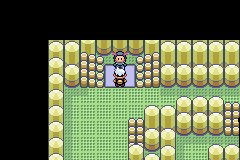 Go on, and you'll reach Route 121. At the middle of this route, you'll see a few Team M/A members saying they're going to go to Mt. Pyre. There are two trainers together here, so you can have a two on two battle. Above them is the Safari Zone. However, without a PokeBlock Case, you won't be able to get in. At the end of the route is Lilycove City.